The 2016 compromise of the league’s Twitter account is one of a number of high-profile social media hijackings. The hacker who broke into the National Football League’s (NFL) official Twitter account in 2016 to report falsely the death of the league’s commissioner Roger Goodell has been sentenced by a court in Singapore to 24 months of probation, Yahoo News reports. Devesh Logendran, an 18-year-old student from Singapore, has pleaded guilty to 11 charges under the country’s Computer Misuse and Cybersecurity Act. The teenager took over the NFL’s Twitter account on June 7th, 2016, rattling off three messages over a span of several minutes. 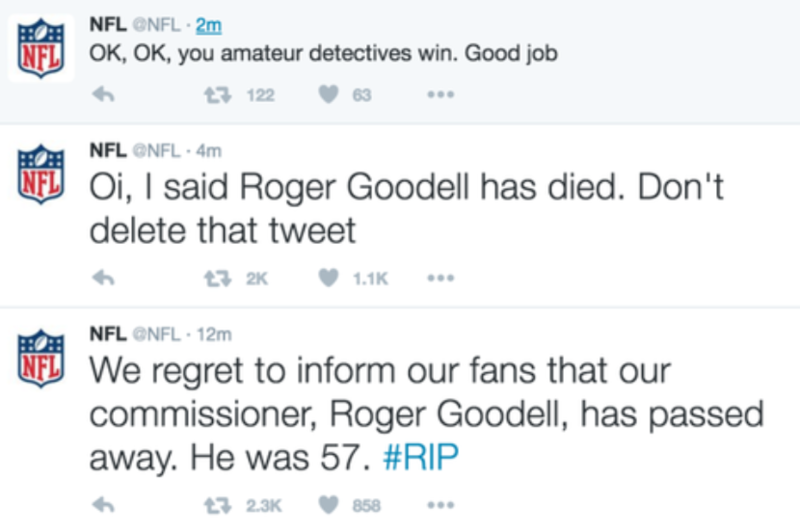 He started by announcing Goodell’s passing, with the tweet immediately going viral. A couple of minutes later, after someone with legitimate access to the account removed the false message, the teenager was back with two mocking retorts. The league then regained control of its account. Speaking shortly after the hoax, NFL spokesman Brian McCarthy confirmed for CNBC that the account had been compromised. He added that the NFL had “engaged law enforcement to look into the matter” and that it was reviewing and beefing up its cybersecurity measures. Two months later, Singapore’s law enforcement authorities received information that the account had been breached from an Internet Protocol (IP) address in the country. The police then determined that the tweets had been posted from the IP address associated with Logendran’s home. Judging by the court documents, the hacker put a sizable effort into taking over the NFL’s validated Twitter account. Long story short, he mostly used publicly available information and leveraged social engineering tricks in a bid to invade the work account of the league’s social media director. “[H]e gained access to all the e-mails the social media director received and used the information to easily obtain the password for the NFL Twitter account”, according to Yahoo News. This is far from the only Twitter hack to announce falsely the passing of a well-known personality. Singer Britney Spears, actor Jack Black, and WWE legend Jim Ross have all been victims of false death rumors propagated by legitimate – but compromised – high-profile Twitter accounts with many followers. In addition to the NFL’s account, Logendran also broke into the online systems of a junior college in Singapore back in 2016.